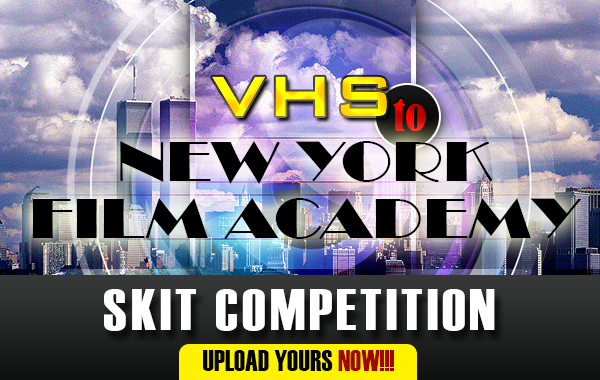 Team VHS and NYFA (New York Film Academy ) present a Skit Competition to all aspiring Actors and Filmmakers. • Full Scholarship to NYFA (New York Film Academy) 1 week Filmmaking/Acting course in South Beach, Miami.
. Shoot a 3-5 minute funny video.
. Upload your video to www.videohitshow.com only.
. Promote your video on youtube to hit maximum views. Deadline for entry is 31st May 2014. Simply subscribe to VHS Channel by clicking the subscribe button on www.videohitshow.com. Then upload your video by clicking the submit button. You will receive an email when your video is approved for entry into the competition. 2. Who is eligible for the competition? Anybody with a passion for filmmaking can enter the competition. You don't have to be a professional, so long as you have a story to tell and you can put the story in a 3-5 minute skit, then you are eligible to enter. 3. What format should I record my video on? You can shoot your VHS skits with your phones or digital cameras and upload in any of the formats accepted by Youtube. Mp4 is still the best format so far. 4. Where will my video appear? 5. How do I win the NYFA scholarship? All entries will be judged by a panel of film makers based on storyline, humour and creativity. The best video entry according to these criteria will be selected as the winner of the NYFA Scholarship. 6. How do I win the $3000 cash prize? 7. Is it possible to win the NYFA scholarship and the cash prize? Yes it is possible to win both the scholarship and the cash prize by simply meeting the criteria for both prizes i.e your video is adjudged the best video based on storyline, humour and creativity and your video also has the highest amount of youtube likes.